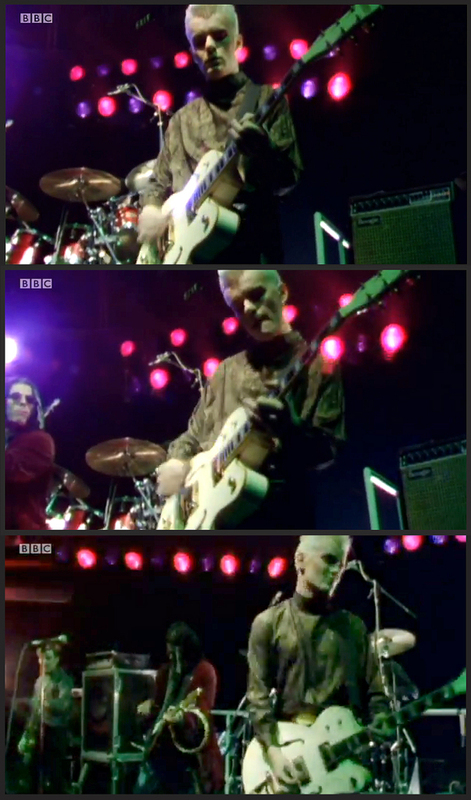 "These stills are from an Old Grey Whistle Test session on BBC TV in 1984 when we played 'Ressurection Joe' before it was even released. When we were filming I was getting into a load of conflict with the BBC sound engineers for being too loud!!!! What an outrage for a guitarist!!! In the end I turned down so much I feared my sound would be really compromised but when it was broadcast it was OK and I think I sounded pretty good as it turned out. But after, I found out that the microphone used by the show presenter, Andy Kershaw, to introduce the band was left on by accident as we played and it was picking up the sound of the instruments and especially my guitar and creating the problem! It was stressful for a young band not too used to LIVE national TV. Needless to say no apology was forthcoming from 'aunty' but at least the rest of the guys found out that "Billy was not being difficult" or at least I hope they did!!! As a point of interest is the miss-spelling of Ressurection in the song title, it wasn't anything mystic just that Jamie designed the sleeve artwork and nobody noticed the mistake. It's probably because the "wrong" spelling looks more "right" than the proper one!"